Cyprus bail-in was the grand experiment of money confiscation and coincided with the great smash of Gold. A lot of people have forgotten about this blue print for action and Gold manipulation has helped to disguise the real connections. Jim Sinclair reminds us about all these interconnections and the main factors in the chain of Debt, US Dollar and Gold. "Somebody is getting very desperate with physical Gold flowing to China and COMEX and LBMA vaults running on fumes. System knows how to dilute the real message, but we are talking here not just about one of the wistleblowers or his credibility - we are talking about Gold and Silver Market Manipulations. "We will ask our rhetorical question again: after LIBOR fraud, FOREX manipulations, Energy market rigging, Mortgage scam and Pension looting - Is The Gold Manipulation To Be Admitted Next?" We have very timely the latest entry on the GATA website on this subject to share." " Jesse reports about the ongoing Game of Musical Chairs in the Western Fractional Reserve Gold System with manipulated LBMA and COMEX Gold markets. With China taking now all physical delivery from the system the entire Western Gold market is under enormous pressure. We found it very positive that with more unleashed attacks on Gold - in order to redeem physical Gold from GLD ETF holdings - it is more and more difficult for Gold market manipulators to keep it under $1300. Physical demand is pushing the price right back up. Goldman Sachs clients are not doing very well if they Sold their gold below $1300 following the House Gold Sell Call. 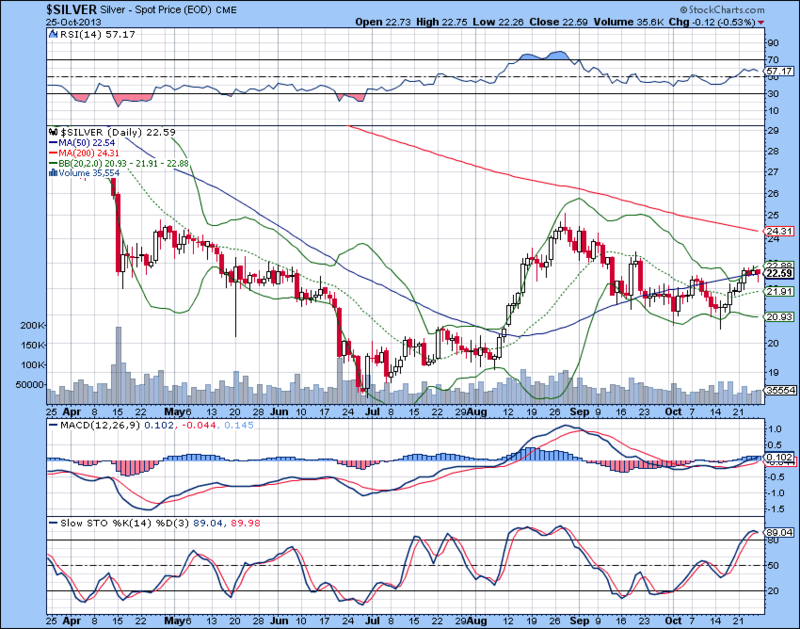 This week we had a very impressive breakout in Gold, Silver and Gold & Silver mining stocks." Lets wait for how long will the "Normal Price Discovery" be ongoing this time. "Gold has spiked to $1349 well before 8.30 am when Initial Claims Report is scheduled to be released. Is the data leaked again? All jobs' data is WORSE than expected again. How can we get on that "Early Bird" email list? 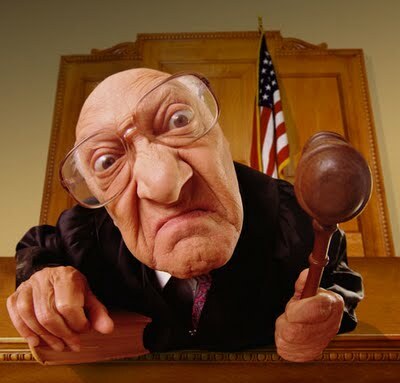 It is just getting totally ridiculous, is there ANY rule of law left in the U.S.?" 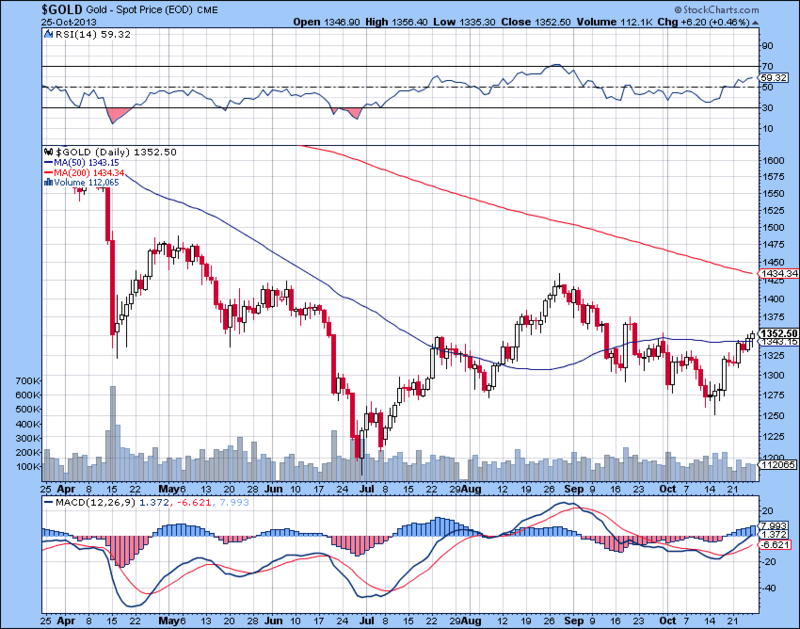 "Cowboys" shorting the Gold market, according to Eric Sprott, must be in a serious trouble now. The yearly trade on October 15th has amounted to 640 million and Gold was Sold at 1270 - 1250 levels. Now with CFTC out of hibernation can we expect at least some kind of investigation? 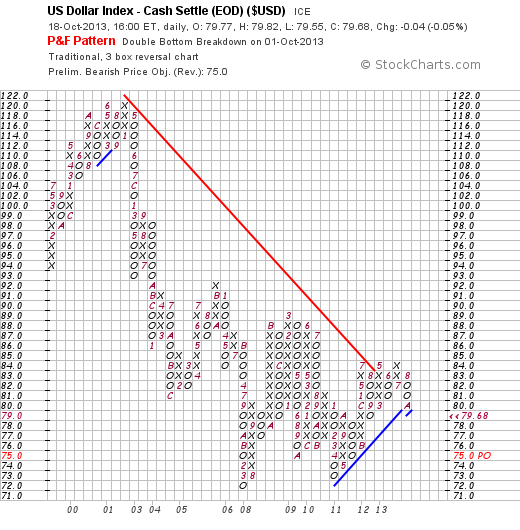 There are more and more calls about the US Dollar loosing its Reserve Currency of Choice status now. Default was avoided, but the damage is done. All FIAT currencies are based on trust. The geopolitical shift is making its way to mass media and we are witnessing the groundbreaking developments in the Gold market. Nobody can manipulate it all the time and China will be busy writing "Thank You Cards" to the FED and related Cartel members at LBMA and BIS, buying all the physical Gold available for Delivery at this levels. We can forget about the Taper until mid 2014 now and Janet Yellen will be following the new FED's playbook written by Michael Woodford. 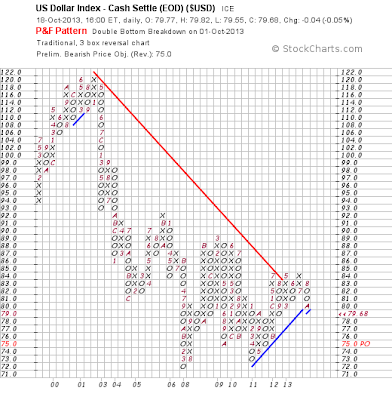 Peter Schiff has dissected for this situation very well." Somebody is getting very desperate with physical Gold flowing to China and COMEX and LBMA vaults running on fumes. System knows how to dilute the real message, but we are talking here not just about one of the whistleblowers or his credibility - we are talking about Gold and Silver Market Manipulations. We have very timely the latest entry on the GATA website on this subject to share. 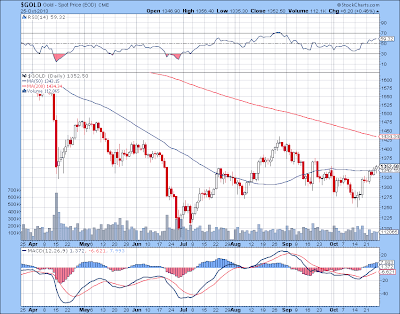 Chris Powell: Gold price suppression -- why, how, and how long? You can find more about this Saga below. Dirty Deeds Done Dirt Cheap: Who is the Real Fraud - Andrew Maguire or Jeffrey Christian? 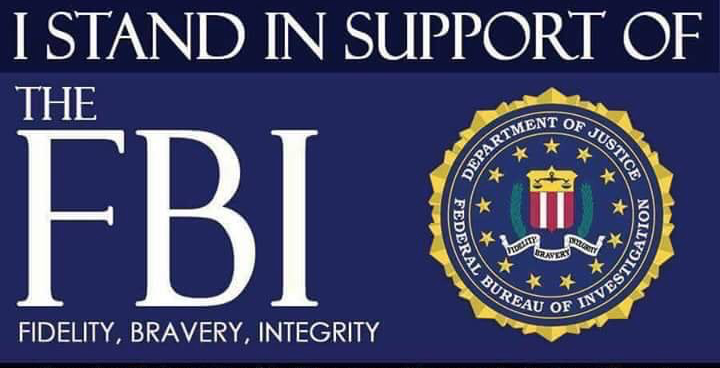 "And finally, we have the link to "The Cabal", now all pieces fall in place. 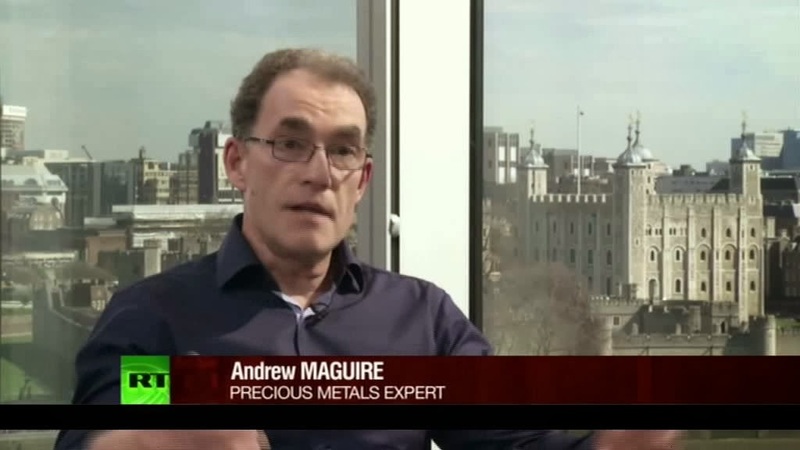 We have the total "Conspiracy" and the same old faces Andrew Maguire is against in his fight. With the next two pieces, please, separate sales pitch from the real information, but they provide a lot of food for thought. The recent events are showing that a lot of former "Conspiracy" theories are closer to reality than CNBC or WSJ front page, but always think for yourself. Our take is that The System is getting closer to its limits now, at first in the Gold and Silver markets. The ongoing war between the corrupt financial system and people still standing for the real human values will include all form of deception and treachery, we will judge all the involved by their deeds and not just words. We know what Andrew Maguire is doing now - he is exposing the fraudulent Fractional Reserve Gold System at LBMA and ongoing manipulations in Gold and Silver markets. Jesse reports about the ongoing Game of Musical Chairs in the Western Fractional Reserve Gold System with manipulated LBMA and COMEX Gold markets. With China taking now all physical delivery from the system the entire Western Gold market is under enormous pressure. We found it very positive that with more unleashed attacks on Gold - in order to redeem physical Gold from GLD ETF holdings - it is more and more difficult for Gold market manipulators to keep it under $1300. Physical demand is pushing the price right back up. Goldman Sachs clients are not doing very well if they Sold their gold below $1300 following the House Gold Sell Call. This week we had a very impressive breakout in Gold, Silver and Gold & Silver mining stocks. We know what Jeffrey Christian is doing - he is attacking GATA and Andrew Maguire now in order to put all idea about Gold Market Manipulation under question mark. Our heart lies more with people like Matt Taibbi and Andrew Maguire here and we hope that baseless allegations will be met with facts by Andrew next week. "Jeffrey M. Christian is Managing Partner of CPM Group. He has been a prominent analyst and advisor on precious metals and commodities markets since the 1970’s, with work spanning precious metals, energy markets, base metals, agricultural markets, and economic analysis in general. Mr. Christian is considered one of the most knowledgeable experts on precious metals markets, commodities in general, and financial engineering using options for hedging and investing purposes. He is the author of Commodities Rising, 2006. He has advised many of the world’s largest corporations and institutional investors on managing their commodities price and market exposures, as well as providing advisory services to the World Bank, United Nations, International Monetary Fund, and numerous governments." We have another article to share about the trade of the year with physical Gold flowing to China via multiple channels. With gold pushing five weeks high before FED meeting catalyst for higher prices could be just a few days ahead of us. "Peter Schiff is very consistent in his views and even if his call for more QE sounds totally outrages do not discount it too fast. ZeroHedge reports that he is not alone in his observations. If it ever happens Gold will receive The Catalyst so many people are waiting for." Market is already reacting to Janet Yellen's appointment to the FED chair - US Dollar is solidly below crucial 80.00 level and Gold and Silver are in breakout stage this week. "Jesse reports about the ongoing Game of Musical Chairs in the Western Fractional Reserve Gold System with manipulated LBMA and COMEX Gold markets. With China taking now all physical delivery from the system the entire Western Gold market is under enormous pressure. In the initial Reuters report on the London-Zurich-Hong Kong-Shanghai gold pipeline, Macquarie gold analyst Matthew Turner suggested that the 1016 metric tonne United Kingdom export (up from 85 tonnes the previous year) might have been shipped to Switzerland for refining into “smaller bars more attractive to Asian consumers or to be vaulted there instead.” Though vaulting cannot be ruled out, the recasting explanation makes considerably more sense given the times and the extraordinary amount of gold being imported by China – over 1500 tonnes so far this year according to research published by the Koos Jansen website. It is difficult to imagine a scenario in which China would be interested in vaulting gold in the West – particularly at a time when the West is experiencing difficult financial and economic circumstances. On the other hand, we know that four of the world’s top gold refineries are located in Switzerland — Valcambi, Pamp, Argor-Heraeus and Metalor. Roughly 70% of the world’s annual gold production is refined in Switzerland and it is considered the center of the world’s gold refinery business. Its bars are trusted on the world’s gold exchanges by the top banks, bullion dealers, jewelry manufacturers, and nation states alike. If Turner is right about recasting the bars into Asia-friendly units, and I think he is, Switzerland would be the place to do it, particularly in light of the volume reportedly being re-refined. In my view, China intends for this gold to be transported to and remain in the East otherwise it would not have gone to the trouble to have it recast into Asia friendly bars. To gain a deeper understanding of what China might be up to, some background is essential. 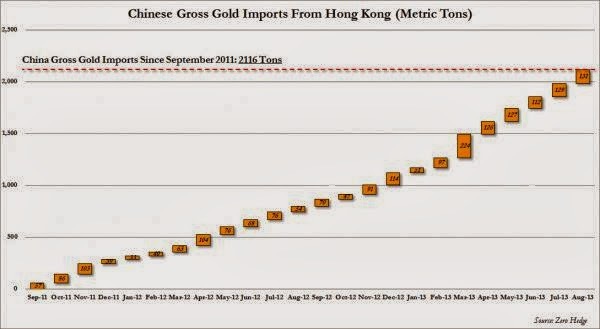 Let’s start with the trading units at the two major Chinese exchanges involved in the gold trade – the Hong Kong Gold and Silver Exchange and the Shanghai Gold Exchange (SGE) – because that goes a long toward explaining why the 1016 tonne export made an initial stop in Switzerland before moving on to China. The tael is the standard unit of weight on the Hong Kong exchange. It equals 1.20337 troy ounces, or 37.4290 grams, fineness in the past has been 99% but this standard has been upgraded to 99.99% to conform to international trading standards. According to gold expert Timothy Green’s The Gold Companion (1991), the standard trading sizes on the Hong Kong exchange is five and ten taels. The basic contract is 100 taels, or 120.377 troy ounces, as opposed to the standard 100 troy ounce contract on U.S. futures’ exchanges. The Hong Kong Gold Exchange is an outlet for much of Asia and the tael trading units, once again according to The Gold Companion are used in China, Taiwan, South Korea, Thailand and Viet Nam. The SGE is the only gold exchange in China and its contract-trading unit is the kilo bar (32.15 troy ounces), once again a significant deviation from the western exchange standard. Should this scenario prove to be accurate, most of the metal moving from London to Asia through Switzerland will more than likely end up in the hands of consumers in the form of jewelry and small bars. What few people realize is that all of this activity is fully sanctioned by the Chinese government and the Peoples Bank of China (PBOC). In fact, once again according to the Koos Jansen website, the Shanghai Gold Exchange is owned by the PBOC and as a result any gold imported and stored at the exchange for future delivery is, indirectly at least, gold inventory at China’s central bank. SGE widely publicizes itself as a “delivery market” thus the smaller and familiar kilo bar size as its chief trading unit makes a great deal of sense. If, as the smaller bar sizes suggest, the UK-Swiss aspect of the pipeline functions as a bar resizing operation, then we may have a long way to go before China’s official sector (central bank) needs are satisfied simply because so much of it is going directly to Chinese consumers. It also implies that the demand we have already seen, as large as it is, could be just the tip of the iceberg. It is no secret that the Chinese people have a traditional, transcending attachment to gold. That same attitude, it should be kept in mind, permeates almost the whole of Asia, and as more and more people partake in the fruits of Asia’s rise economically the demand for gold is likely to grow with it. China is likely to take advantage of any drop in the price to load up as it did in the April-August, 2013 time period. In one of my early articles on China’s burgeoning interest in gold (June, 2009), I indicated that Chinese demand would likely put a floor under the market for many years to come. The statistics below bear that out. John Dizard’s column in this weekend’s Financial Times explores the unsettling developments in the physical gold market and what problems they might impose on the paper gold market. Though the column itself is a very positive one for gold’s prospects, it runs under a negative headline that has little to do with the content: Cry of negative gofo heralds trouble for gold. The words “paper traders” should have been added to end of the headline, because that is clearly the point Dizard is making. One more point of interest before I put this piece of the China analysis to rest: HSBC, the multinational bank headquartered in London, is the chief storage facility for the largest gold ETFs. As mentioned in my previous article, much of the gold transferred to Switzerland by HSBC came out of the ETFs. In addition, HSBC is an important trading member in the daily London Gold Market Fixings. Founded by Sir Thomas Sutherland in the British colony of Hong Kong in 1865, HSBC stands for the Hong Kong Shanghai Banking Corporation." Peter Schiff is very consistent in his views and even if his call for more QE sounds totally outrages do not discount it too fast. ZeroHedge reports that he is not alone in his observations. If it ever happens Gold will receive The Catalyst so many people are waiting for. And so, one by one, the crazy pills theories start rolling out. Yesterday, as we first pointed out, Deutsche Bank made waves when it became the first "serious" organization to suggest that the Fed has now missed its tapering window, and will plough on thorough until the next downturn without ever lowering the pace of Flow (of course the reflexive paradox that the economy would be in an out of control depression without QE in the first placesomehow does not figure in that calculation). And while this has not been a novel idea (we first predicted that once perpetual QE starts it will never taper, long before QE 3, aka QEternity was even publicly announced last summer) today, all the penguin "pundit" copycats have jumped aboard this theory. Well, not all. SocGen has decided to make waves of its own with an even crazier pills idea: instead of no taper... ever... the Fed, that glorious redistributor of wealth from the middle class to the 1%, while happy to adhere to that old saying: "a funded welfare program a day, keeps the guillotines away" will not only not announce a Taper in next week's FOMC meeting but will in fact hike QE! Although we assign a very low probability to a decision by the FOMC toincrease asset purchases at its October meeting, it is not a possibility we can ignore. Assuming the Fed does not increase asset purchases this year, we consider the bottom of the range on the 10yT to be 2.40%. The market impact of an increase in Treasury and/or MBS purchases would be to rally the long-end of the curve back towards 2.00%, destroy volatility (again), possibly tighten the mortgage basis, and supporting equity, credit and emerging markets. The potential downsides to increasing asset purchases would be that (1) the market would assume the FOMC was focusing on a very grim economic picture; (2) the perceived risk of inflating asset bubbles in various market segments would rise; and (3) the FOMC may run into a credibility problem (again) by whipsawing the market. The outcome for the US rates market going into year-end could vary dramatically based on what the FOMC signals next week. Scenario 1: The FOMC statement is relatively unchanged, recognizes recent economic weakness as potentially temporary, and suggests that a reduction in asset purchases within the next six months has not been removed from consideration. Probability: 50%. 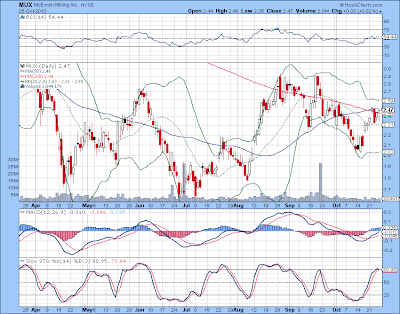 Lower end of range on 10yT: 2.40% through November; possible sell-off in December if data begins to improve. Scenario 2: The FOMC statement reinstates language that asset purchases could be increased or reduced, and raises greater concern about recent economic weakness. Probability: 40%. Lower end of range on 10yT: 2.30% through November; sell-off muted or unlikely unless December FOMC statement and communication begin to reinstate possibility of tapering in Q1 14 in response to improving fundamentals. Scenario 3: The FOMC increases asset purchases by $10-20bn in October.Probability: 10%, with full disclaimer that our economics team thinks this probability is closer to 0.0001% and that your author is nuts! Lower end of range on 10yT: 2.00%. The bull flattening of the Treasury curve will run us all over. In retrospect, this suggestion as ludicrous as it is, makes sense. After all, the Fed has lost so much credibility, it will never make up for it with a taper in October, December, March or June. In fact, the longer the Fed delays tapering (which it now will never do), the greater the confidence loss. So since there is no downside to going full retard and never tapering again, the Fed may as well go the other way: after all, it is not as if anyone on the FOMC understands what a collateral shortage is, or how dire its implications are, despite the TBAC's best efforts to educate the clueless academics in America's Politburo. And the other upside from the Fed announcing a $15-20 billion, or moar, increase in October or shortly thereafter, is that it will merely bring the grand reset that much closer. Which, considering the centrally-planned, crazy pills New Normal world we live in, is easily the best possible outcome. So do your worst: Janet. We, who are about to drown in your liquidity, salute you." BEIJING, Oct. 28 (Xinhuanet) -- Argentine President Cristina Fernandez’s governing bloc held onto control of Congress in Sunday’s elections, but the results has dashed her hopes of a third term. Opposition leader, Sergio Massa, beat Martin Insaurralde, the candidate that Fernandez hand-picked to lead her slate for Congress. The opposition won a decisive 12-point margin in Buenos Aires province, where 37 percent of Argentina’s voters live. With 72 percent of the votes counted nationwide, the governing Front for Victory has won 33 percent of the congressional votes overall. But the party looks certain to fall far short of the two-thirds majority needed to revise the constitution. And there will be no third term for Fernandez when her current term expires in 2015. Sergio Massa, former cabinet chief, who quit government four months ago, has risen to prominence. "I also want to thank this group of 20 elected officials from the province of Buenos Aires who had the courage, the merit, but above all the conviction to choose to take a step forward and construct a path to the future." 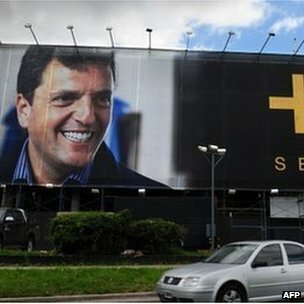 said Sergio Massa, Frente Renovador Candidate. We have the very good news from Argentina elections today! Maybe now Argentina will get the blessings and its proud people will get the much better life they deserve. We are monitoring the situation. Monday will be very interesting trading day now! 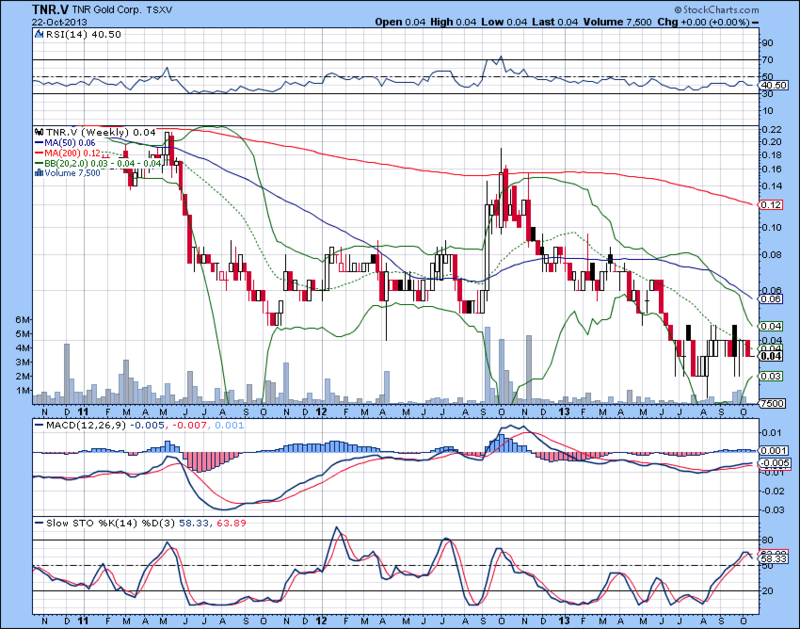 Our Watch List: TNR Gold, McEwen Mining, Lumina Copper, International Lithium and Rodinia Lithium. 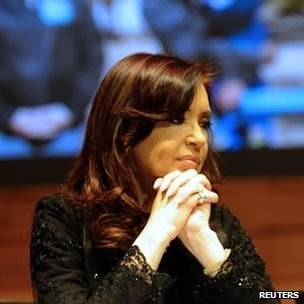 "Argentina President Cristina Fernandez de Kirchner's hopes of changing the country's constitution to enable her to run for a third term have been dashed. Yesterday the country held elections for its upper and lower legislative houses, and President Cristina Fernandez de Kirchner's party lost big. Her party garnered only 28% of the vote nation-wide, as opposed to the 54% it garnered in 2011. Across the country, newspapers are calling this the "el fin de la hegemonía K" — "the end of the Kirchner hegemony." CFK needed to keep a two-thirds majority in Congress to be able to change the Constitution with ease — that's how she passed the nationalization of YPF and other controversial legislation. Now her party only has a slight majority in both houses. More"
With more than 75 percent of the electorate having cast their vote, polls closed in Sunday’s legislative elections, in which Argentines voted to choose half of the Lower House of Congress and a third of the Senate. According to exit polls, Renewal Front candidate and opposition leader Sergio Massa was leading in the key province of Buenos Aires over rival Martín Insaurralde, President Fernandez's star candidate. In the City of Buenos Aires, Gabriela Micchetti, from the ruling PRO party, was on course to win two seats in the Senate. Briefing reporters, Interior and Transport Minister Florencio Randazzo said elections took place “with normality” across Argentina. Only one incident was registered in the Buenos Aires locality of Merlo where the Victory Front reported that Renewal Front polling station authorities “took out and destroyed” ballot papers. They were later detained by the police. Attention is focused, as usual, on Buenos Aires province, which accounts for nearly 38 percent of the country’s voting roll. These elections are marked by the absence of the Fernández de Kirchner who underwent a brain surgery earlier in October. As she was recommended strict rest by doctors, Vice President Amado Boudou replaced her during the electoral campaign." (Reuters) - Candidates sponsored by Argentine opposition leader Sergio Massa won the House of Deputies' midterm election by a 10-percentage-point margin on Sunday in the key province of Buenos Aires, according to an exit poll announced on television channel TN. Massa, the mayor of the affluent Buenos Aires town of Tigre, headed his own list of candidates for Congress and is seen as a possible, business-friendly presidential contender in 2015." "In these particular Investment Plays we are substituting geological risk with geopolitical. It is our Tenke 2.0 with Lukas Lundin all over again. 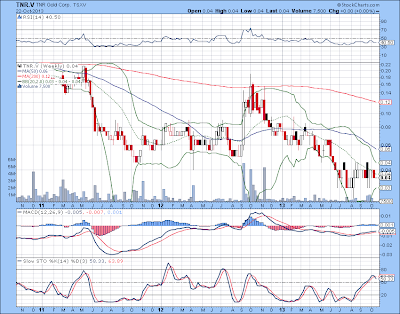 Now the "Chief Owner" is Mr Gold Corp - Rob McEwen with his stake of 25% in McEwen Mining. At stake is Los Azules Copper project with its almost 20 B lb of Copper safely kept under the ground in the great country of Argentina. Lumina Copper with its Taca Taca deposit in Argentina is in a break out mode with closing above CAD6.29 today and indicates that proud Argentines deserve a better economical life as well and we can witness return of very pragmatical political approach to the mining very soon now. Lets dig out what these Elections are actually all about." We have another confirmation in the report from Bloomberg on ongoing bidding and valuations of Las Bambas copper project in Peru. All this information must be confirmed by the official companies' releases, but we can get the big picture already. China is implementing its long term state level plan to secure strategic resources and diversify from US Dollar denominated assets. 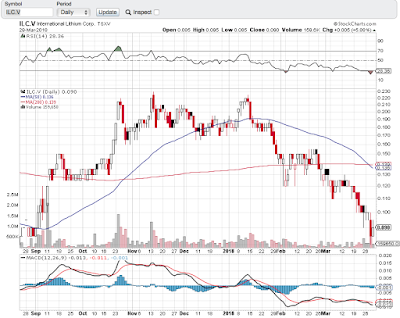 Lumina Copper is trading above CAD6.00 again and the company talks about 9 companies visited the property during the DD stage. Company has risen from August low more than 60% on prospect of the potential sale this year to the Copper producer, according to the company presentation. Investors of Lumina Copper, McEwen Mining and TNR Gold are watching closely the midterm elections due this weekend in Argentina. There is a hope that recent improved valuation of Lumina Copper is signalling the return of more pragmatic approach to the mining sector in Argentina. 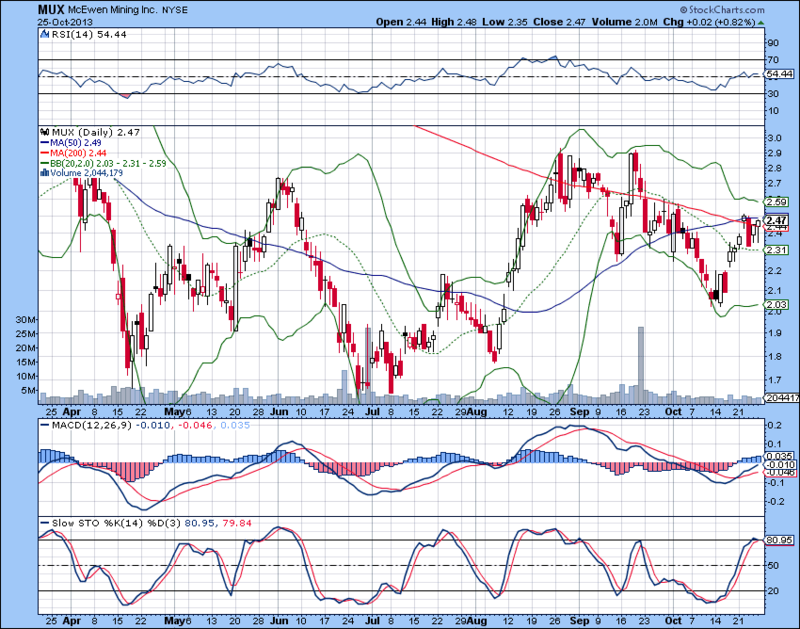 "Lumina Copper looks much more optimistic these days. Argentina was the place to go for mining 5 short years ago and the last two years it was crashed into the ground with the mining stocks operating there. Now we see a glimpse of hope and few deals are showing that the better future is to come for the proud people and the great country. 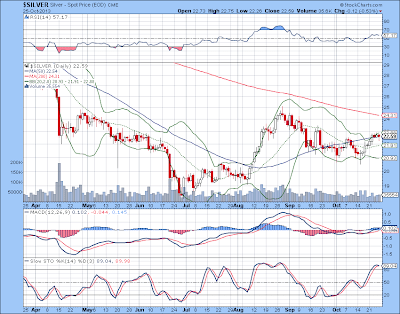 Companies to watch: McEwen Mining, TNR Gold, Lumina Copper, International Lithium, Rodinia Lithium." 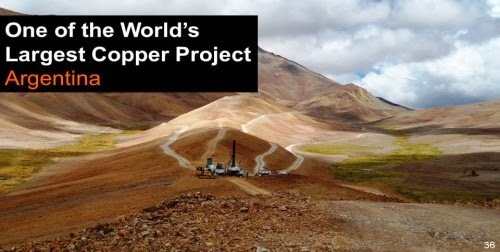 "We have more news coming out of London on the Las Bambas copper mine bidding war. More reports are coming out now with the positive outlook for copper as well, but the most important in any market is the money talk and now the real money has been put on the table. Only one buyer will be successful in this bidding war and it will bring industry attention to Los Azules copper project with the valuation catalyst for McEwen Mining and TNR Gold. Lumina Copper recent advance with its Taca Taca copper project also located in Argentina is the very good sign of things to come here." 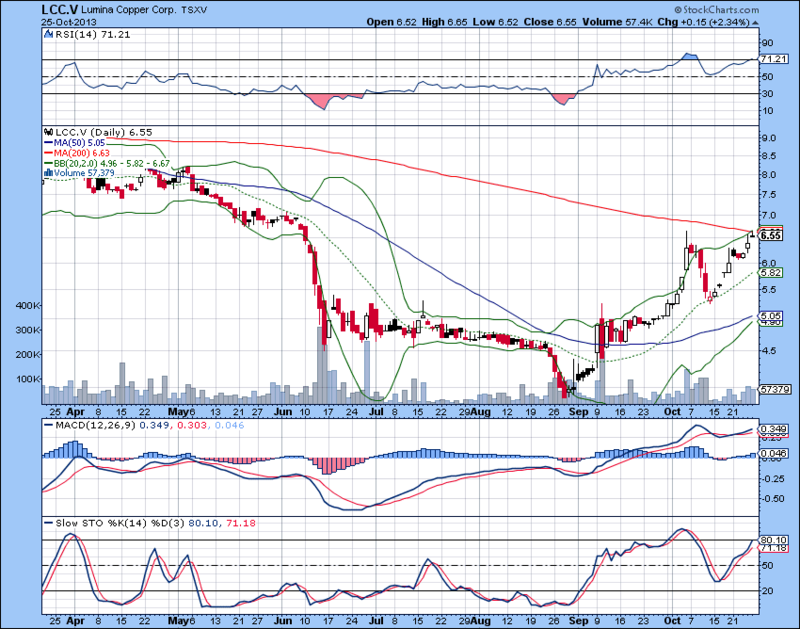 "Lumina Copper has become one of our main success stories this summer which we have shared with our fellow travelers. As you know, we are not giving any investment advice here and our observations of the markets and trends will stay only observations until Mr Market will make up his mind. Please read our full legal disclaimer. With Lumina Copper we have noticed the catalyst when Ross Beaty has increased his 22% in the company and bought 1 million worth of shares this summer. For us it is our "Dream Team" with Tenke Mining all over again: one of the best mining leaders at the helm with his personal wealth at stake, goods are there - safely in the ground - and the valuation is extremely distorted by the political risk perception. The dive in commodity prices did not help the valuation in the first half of the year either. The fear of dramatic slowdown in China was hanging over the market. 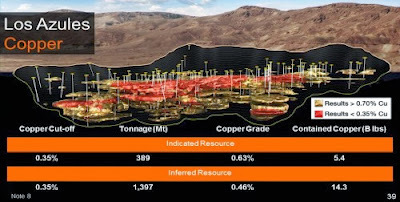 Then we have news start to flow from Clencore:"
"Rob McEwen is taking Taca Taca Copper deposit as the proxy for valuation of Los Azules Copper deposit. 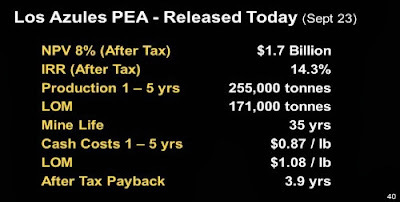 After recently released by McEwen Mining updated PEA on Los Azules we found it interesting that CIBC has reaffirmed its stock rating for Lumina Copper with CAD15.00 target price. 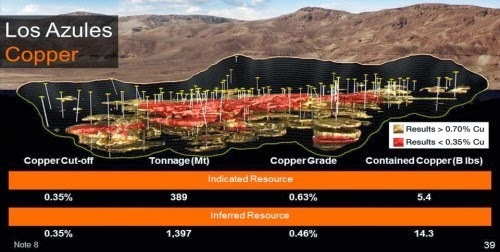 Lumina Copper is trading now at CAD5.00 and this target price will put the valuation of Taca Taca Copper deposit at $650 million. Now you can slice it and dice it with the Mr Market mood. Any analyst valuation will be the the pie in the sky until Mr Market will confirm it, that is why for us is very important when Insiders are voting with their own money on the valuations. 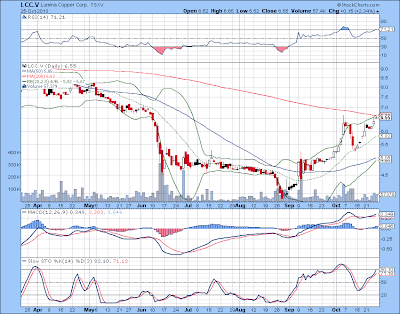 Ross Beaty bought 1 million worth of stock in Lumina Copper this summer. 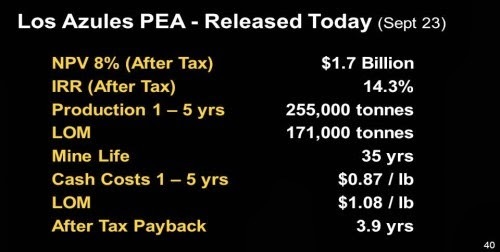 We are expecting now that analysts will start to put valuations in their research notes on Los Azules Copper after the updated PEA." Voters in Argentina go to the polls on 27 October in a key test for left-leaning President Cristina Fernandez de Kirchner. These important mid-term elections will determine whether she will have the chance to run for re-election in two years' time. The president herself is out of action during the campaign following emergency brain surgery earlier in October. The mid-term legislative elections are seen as the first step towards presidential polls in 2015. President Fernandez has never publicly confirmed she would like to seek a third term, though there have been public suggestions she might. Currently, the constitution limits the number of consecutive presidential terms to two, and a two-thirds majority in both houses of parliament would be needed to amend it. Should Ms Fernandez's Front for Victory (FPV) fare badly in the October polls, this may signal a coming end to more than a decade of Kirchner family rule in Argentina. Cristina Fernandez de Kirchner's late husband Nestor ran the country between 2003 and 2007, when he was succeeded as president by his wife. She was then elected for a second term in 2011. Argentina's parliament, the National Congress, consists of two chambers: the Chamber of Deputies or lower house, and the Senate or upper house. Members of the country's legislature are elected through proportional representation on party lists. The October mid-term elections will choose 127 members of the 257-strong Chamber of Deputies and a third of the Senate's 72 members. Deputies will be elected for four years, and senators for six-year terms. Argentines will be voting for lists selected in primaries held in August, where parties and alliances had to overcome a 1.5% threshold. Voting is compulsory for Argentine citizens aged between 18 and 70. This is the first election where 16- and 17-year-olds can cast their votes, voluntarily. Who is running in the polls? A large number of electoral alliances are fielding candidates. These alliances often include parties from diverse ends of the political spectrum, and their composition can vary from province to province. The key race is expected in the country's largest electoral district, the province of Buenos Aires, which includes the Greater Buenos Aires metropolitan area of more than 10 million inhabitants. The province accounts for more than a third of the national electorate. The frontrunner there is the Renewal Front, an alliance that includes the centre-right Republican Proposal (PRO). Its list for the Chamber of Deputies is headed by the mayor of Tigre, Sergio Massa. Mr Massa is a former ally of Nestor Kirchner, and served as the Cabinet of Ministers chief under President Fernandez in 2008-09. Mr Massa was elected mayor on the Kirchnerist Front for Victory ticket, but left the party in June 2013 to establish the Renewal Front. Mr Massa's alliance came first in the provincial primary held on 11 August. Mr Massa is widely seen as a potential candidate for president in 2015. Ms Fernandez's ruling Front for Victory is Mr Massa's main rival here. The FPV's list for Buenos Aires province is headed by Martin Insaurralde, mayor of Lomas de Zamora. What's the impact of the president's health issues? Ms Fernandez has been forced out of electioneering after undergoing surgery to remove a blood clot from her brain, believed to be a complication from a head injury she sustained in August. Doctors released her from hospital on 13 October but ordered her to halt her congressional election campaign and rest for one month. This was not her first health scare. In 2012, she had a thyroid gland removed after being misdiagnosed with cancer. Sympathy for Ms Fernandez following her husband's death in 2010 is likely to have played a part in her re-election the following year. But recent opinion polls show that sympathy for the president's health is unlikely to affect her popularity ratings. What else has affected the campaign? 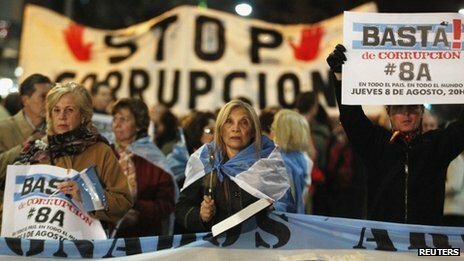 The global economic downturn has taken a toll on Argentina's economy, and the government's austerity measures have done nothing to bolster its popularity. The congressional election campaign is taking place against a background of foreign currency shortages, falling consumer and investor confidence and dissatisfaction with import restrictions, export duties and tight government controls on the economy. Independent economists say inflation in Argentina is among the highest in the world at about 25%, which is more than double the official rate. Who is likely to come out on top? The August primaries indicated that Ms Fernandez may struggle to keep control of the National Congress, let alone build up a two-thirds majority. Her Front for Victory won just 26% of the nationwide vote in the primaries, losing in the all-important Buenos Aires province to Mr Massa's list. This level of performance is far below the 54% support that propelled Ms Fernandez into a second term in 2011. It may also not be enough for her to keep control of the country's legislature. 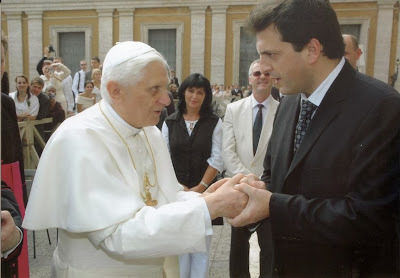 A recent poll shows Mr Massa's supporters leading over Martin Insaurralde's list, 40% to 33%, in Buenos Aires province. But the ruling Front for Victory's chances are helped by the fact that most of the opposition's seats in parliament are up for renewal in the October elections. Its own contested seats are also thought to be relatively safe. In the last election in 2009, the party managed to cling to them despite a sharp dip in the government's popularity over a rise in export duties on farming products."